MTSU offers the only Bachelor of Science degree in Dance at a public university in Tennessee. The program promotes diverse intellectual and artistic scholarship, while fostering professional and social excellence in a liberal arts setting. Through studio training, dance studies courses, and curricular and co-curricular activities, our students can be prepared to become artists, scholars, educators, arts advocates and leaders in the field of dance and beyond. Admission to the B.S. in Dance is through audition only. Dance study at MTSU emphasizes a holistic approach that rigorously trains the body and engages the mind. Dancers are encouraged to develop creative and critical perspectives. Students are expected to examine the cultural and historical contexts of dance and to develop the abilities to both move and think logically, critically, and creatively, and to communicate clearly. Every semester, guest artists collaborate with MTSU’s pre-professional dance company to stage works for MTSU Dance Theatre. Guest artists spend a full week in residence, teaching classes, giving talks about their creative process and careers, and rehearsing a select group of students for performance. In recent semesters, students have worked with a range of artists including T. Lang Dance, Jesse Zaritt, Teena Marie Custer, and Dance Magazine “breakout” choreographer Christopher K. Morgan. Guest artist relationships form the foundation of students’ future professional networks. MTSU Dance students share their art both on and off campus. In addition to local performance opportunities throughout Tennessee in cities such as Knoxville, Chattanooga, Tullahoma, and recently at The Frist Center for Visual Arts in Nashville, students travel for regional conferences and festivals, including the American College Dance Association, the Women in Dance Leadership Conference, and the American Dance Festival. Nationally and internationally students have traveled for training and performance to cities such as New York, Chicago, Denver, Columbus, and Dallas, and internationally to Europe and China. These off-campus opportunities further students’ professional experience and understanding of the field. Prior to graduation, MTSU students have opportunities to equip themselves with the knowledge, skills, and experience required to attend graduate programs, work in a variety of dance and arts related professions, and contribute to dance within a global society. 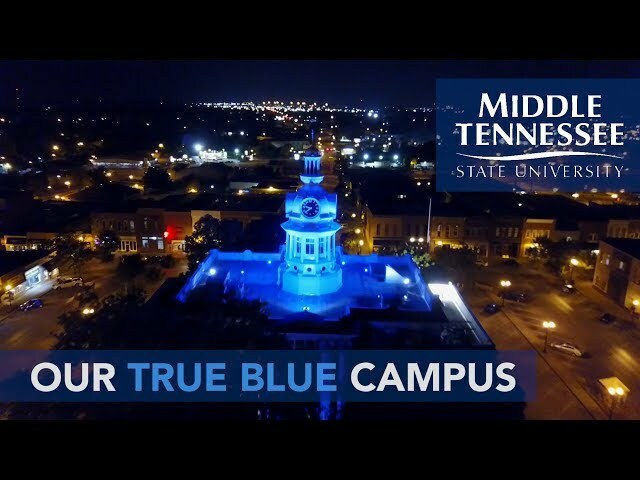 The emphasis upon national and international work, creative engagement of mind and body, and a vast array of performance opportunities makes MTSU's Dance Program distinctive in the United States, and the success of our students offers testament to the outstanding and visionary instruction in dance and the arts at Middle Tennessee State University. MTSU Dance students receive training that can lead to many careers, with graduates finding performance opportunities in professional companies, in the entertainment industry, and as entrepreneurial artists and choreographers. Graduates also teach in studios, schools, and community-based programs, further their education in graduate school and teach at the university level, and apply their dance knowledge to a broad range of fields including exercise science, somatic training practices like Alexander Technique, and dance therapy. The Theatre and Dance Department offers two majors—Theatre and Dance—both of which lead to a Bachelor of Science (B.S.) degree. Coursework for the Dance program includes technique, choreography, performance, dance history and criticism, education, and kinesiology. Dance majors choose one of two curricular tracks: Performance and Choreography or Pedagogy in Practice. Undergraduate minors in Dance, Entertainment Arts Design, Musical Theatre, and Theatre are available. The B.S. in Dance provides students with diverse opportunities to develop theoretical and practical applications of dance. The program is designed to prepare students for the profession or further study at the graduate level. Students should consult with their advisors each semester in order to plan their schedule of courses. Students majoring in Dance must select a specialized track of study: performance and choreography or dance pedagogy in practice. Admission to the B.S. in Dance is through audition only, and students must maintain a 2.0 GPA in all dance course work. Students audition to be accepted into the Dance major through four regularly scheduled auditions every year. For additional information and to register for the audition, contact the dance program coordinator. An overview of the contemporary dance scene and its recent history in aesthetics, scholarship, and in the marketplace. Prerequisite: Permission of instructor. Exploration of movement, technique sequences, and choreographic forms; basic elements of notation. Offered fall semester only. (Same as MUS 4570/THEA 4570.) For those interested in improving ease and freedom of movement, balance, support, flexibility, and coordination in daily activities. Prerequisite: DANC 2010 or DANC 2040. An experiential study of the human body in rest and in motion. Emphasis on the skeletal and muscular systems in consideration of applications to dance performance, teaching and creative processes, injury prevention and rehabilitation, nutrition, environmental effects on the human body, and the emerging area of dance medicine while training for classical ballet and modern dance. Offered spring semester only. Prerequisite: DANC 2000 A survey of dance from primitive to the present with an emphasis on the style and techniques of dance as it was performed.Offered fall semester only. Prerequisite: Successful completion of 75 credit hours and permission of department. A capstone to the dance student's undergraduate career and preparation for transition to the professional world or graduate study. Includes lectures, workshops, professional guest speakers, and discussion sessions. Students will complete various paper-based projects, a capstone research project, resume, and portfolio construction. Intermediate modern dance techniques. Meets three hours per week. May be repeated for a maximum of 4 credits with permission of instructor. Intermediate ballet techniques. Meets three hours per week. May be repeated for a maximum of 4 credits with permission of instructor. Prerequisite: DANC 2010 or permission of instructor. Intermediate/Advanced studio technique. Meets four and one-half hours per week. May be repeated for a maximum of 4 credits with permission of instructor. Prerequisite: DANC 2040. Intermediate/Advanced ballet techniques. Meets for three hours per week. May be repeated for a maximum of 4 credits with permission of instructor. Modern dance techniques; emphasis on exploration of fundamentals of dance as a form of artistic communication. For students with little or no previous experience in modern dance. Meets three hours per week. May be repeated for a maximum of 4 credits. Contemporary jazz dance techniques; emphasis on exploration of fundamentals of dance as a form of artistic communication. For students with little or no previous experience in jazz dance. Meets three hours per week. May be repeated for a maximum of 4 credits. Tap dance techniques; emphasis on exploration of the fundamentals of dance as a form of artistic communication. For students with little or no previous experience in tap dance. Meets three hours per week. May be repeated for a maximum of 4 credits. Classical ballet techniques; emphasis on exploration of ballet as a classical art form. For students with little or no experience in ballet. Meets three hours per week. May be repeated for a maximum of 4 credits. The study of a variety of physical conditioning methods, somatic practices, and injury prevention techniques that promote movement efficiency and physical development of the dancer's body. Intermediate jazz dance techniques. Meets three hours per week. May be repeated for a maximum of 4 credits with permission of instructor. Intermediate tap dance techniques. Meets three hours per week. May be repeated for a maximum of 4 credits with permission of instructor. Prerequisite: DANC 2020 or permission of instructor. Intermediate/Advanced jazz dance techniques. Meets three hours per week. May be repeated for a maximum of 4 credits with permission of instructor. Prerequisite: DANC 2030 or permission of instructor. Advanced tap dance techniques. Meets three hours per week. May be repeated for a maximum of 4 credits with permission of instructor. Prerequisite: DANC 3040 or permission of instructor. Study of pointe work with an emphasis on building strength, coordination, stability, proper alignment, and correct execution within the traditional format of a ballet class. May be repeated for a maximum of 4 credits with permission of instructor. Prerequisite: Permission of instructor. Performance-level techniques and choreography for solo and ensemble pieces in both classical and contemporary styles. Meets four and one-half hours per week. May be repeated for a maximum of 6 credits with permission of instructor. Prerequisite:DANC 3010. Pre-professional level techniques and choreography for contemporary dance. Meets four hours per week. May be repeated twice with permission of instructor. Students will be expected to develop proficiency in multiple movement styles and learn advanced repertory. Prerequisite: DANC 4100 or permission of instructor. Directed study of a choreographic project. Exploration of choreographic techniques to develop an original group dance and the execution of plans for costumes, lighting, make-up, and sound. Offered spring semester only. Explores improvisation as a mode of dance training, creative inquiry, and performance practice. Students introduced to specific improvisational structures, approaches and scores, and will develop improvisational strategies within contemporary dance performance. Permission of instructor and co-registration in DANC 1010, DANC 1020, DANC 1030, DANC 1040, DANC 2010, DANC 2020 DANC 2030, DANC 2040, DANC 3010, DANC 3020, DANC 3030, DANC 3040, or DANC 4040. All aspects of concert planning and production as performer and crew member. May be taken for one credit per semester for a total of 6 credits. Prerequisite: Permission of instructor. Techniques of dance for musicals, comedies, operas, television, and stage and choreography for these forms. Overview of costume in the arts and entertainment; an orientation to costume, design, management, technology, wardrobe practices, and costume critique methods through projects developed through research, problem-solving, and documentation; focus on student career and portfolio development. Laboratory hours and/or crew requirement. Lectures and practical experience in the methods and techniques of lighting for the stage. Emphasis on creation of lighting design for performance through the study and knowledge of electricity, circuity, instrumentation, control equipment, and fundamental properties of lighting design. Major projects in lighting design. Crew requirement. Prerequisites: 2000-level dance technique courses in ballet or modern dance and permission of department. Dance as a viable activity that can enhance the learning process. Explores the discipline of dance as basic to an education for all people. Educational and aesthetic theories and practices related to fashioning developmentally appropriate dance experiences for children. Offered even-numbered fall semesters only. Prerequisites: DANC 1010 and DANC 2010 or DANC 1040 and DANC 2040. Theory and practice of teaching classical ballet and modern dance techniques based on sound anatomical and kinesiological principles. Prerequisite: Approval of chair or dance faculty. Students assigned to work with professional dance companies or arts centers. Pass/Fail. Tucker Theatre accommodates major music, dance, theatrical, and television productions, along with performances in intimate settings and a wide variety of events such as award ceremonies, films, pageants, recitals, product launches, receptions, and meetings. For event information, Please call 615.494.8810. For Tickets call, 1.888.718.4253. Thank you! All events at Tucker Theatre are scheduled through our production office. Call 615/898-2181 between 8:30 a.m. and 4:00 p.m., Monday through Friday for rental information. The Anderson Studio Theater is a flexible black box space. It is primarily used for student-produced performances. The space is perfect for smaller, more intimate productions. MTSU has two fully equipped dance studio spaces for rehearsals and dance classes. Both rooms have a full mirror wall, as well as easy-to-use audio equipment. The Scenic Studio is designed for the construction of our scenic elements for all Theatre and Dance productions, as well as stagecraft classes. The Costume Studio is designed for the production of costumes for all Theatre and Dance productions, as well as costuming classes. The Design Studio is equipped with a state-of-the-art light box and an ETC Ion lighting console that allows designers to work on a scale model of Tucker Theatre. Students also have access to the computer lab and drafting materials.